There are currently three different versions of the SMART Box™ disclosure – for term loans, lines of credit, and merchant cash advances — that take into account the differences between the products while still utilizing common pricing metrics and calculations, as well as standardized language. The SMART Box disclosure has two main parts. The first part presents basic elements of the finance option under consideration, including the amount financed, the funds disbursed, the total repayment amount, the expected term, and the frequency of payback (as applicable). The second part of the SMART Box presents four common pricing metrics: total cost of capital, APR (estimated for merchant cash advances), the average monthly payback, and the cents on the dollar cost of the financing option. Total Cost of Capital (TCC): The total cost of capital metric or TCC captures all interest, loan fees (for certain products that do not charge interest, but rather a fixed fee for capital), and any other fees that are a condition of receiving capital. The total cost of capital metric states the total dollar cost of the finance option – a crucial source of information for a small business customer. Annual Percentage Rate (APR): The APR metric provides the cost of capital –including fees that are a condition of receiving capital, when applicable– expressed as a yearly rate. 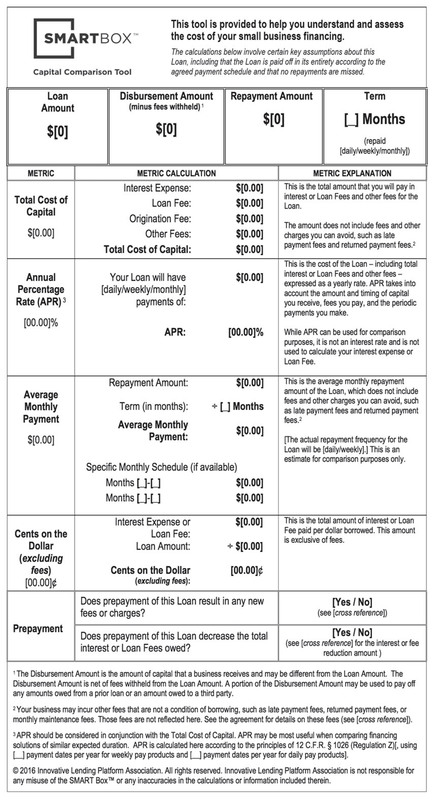 Note that while APR can be used for comparison purposes, it is not the interest rate applied or used to calculate the total dollar cost of a finance option. For this reason, APR should be considered in conjunction with TCC. Average Monthly Payment: The average monthly payment metric captures the average monthly cash flow impact of repaying the particular finance option under consideration. Regardless of whether the product requires daily, weekly, or monthly repayment, the average monthly payment provides a common benchmark for assessing monthly cost. Cents on the Dollar: The cents on the dollar metric captures the amount of interest (or loan fees, as applicable) paid per dollar borrowed. This metric is exclusive of all other fees to allow for comparison with other common pricing metrics in commercial finance, including the factor rate, simple interest, or total interest percentage. The SMART Box also presents the small business owner with two questions regarding the prepayment policy applicable to the finance option under consideration. The first question asks whether prepayment will result in any new fees or charges not already captured in the SMART Box. If the answer is “Yes,” the SMART Box requires a cross-reference to clear and conspicuous disclosure in the provider’s loan documents that describes the incremental fee or charge. The second question asks whether prepayment will result in any reduction in interest or the applicable loan fee. If the answer is “Yes,” the SMART requires a cross reference to clear and conspicuous disclosure in the provider’s loan documents that states the amount of the reduction. As an enhanced disclosure, the SMART Box helps bring the applicable prepayment policy to the attention of the small business. Finally, each SMART Box disclosure assumes that the finance option will be repaid in its entirety according to the terms of the applicable agreement and that no payments will be missed. Ultimately, we believe that the SMART Box is a major step forward in further empowering small business customers to make well-informed decisions in selecting a small business finance option that serves their business need or use-case. Copyright © 2019 Innovative Lending Platform Association. All Rights Reserved. To engage with the Innovative Lending Platform Association or learn more about the SMART Box™, please fill out the form below or email: info@innovativelending.org. I am interested in adopting the SMART Box and would like more info.